Germ cell apoptosis plays a pivotal role in normal spermatogenesis and is a highly complex process involving genes for various factors such as the Bcl-2 family, Fas, Fas ligand, and p53. Germ cell apoptosis has been considered to guarantee the quality of gametes [50-52]. Many studies with heat stress models have analyzed germ cell apoptosis with local heating at 43°C. Exposure at 39°C had no significant effect detectable by terminal deoxynucleotidyl transferase (TdT)-mediated dNTP nickend labeling (TUNEL) . This is a rapid process—spermatocyte apoptosis occurs 12-24 h after exposure to heat, continues for several days, and the number of spermatocytes returns to nearly the pretreatment level in 1-2 months. In humans, the cell cycle arrest in spermatogonia but not spermatocyte apoptosis may play a major role in the deterioration of spermatogenesis (as observed in conditions such as vari-cocele and cryptorchidism). 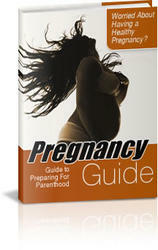 In fact, it is still debated whether varicocele induces apoptosis of germ cells . This is because TUNEL, which is commonly used to detect apoptotic cells, has low sensitivity. Another possible reason is that external-ization of phosphatidylserine occurs at an early phase of apoptosis, and externaliza-tion at the apoptotic germ cells precedes the activation of caspase 3 , resulting in prompt phagocytosis by Sertoli cells in vivo before the cells can be detected by TUNEL. A previous study in patients with varicocele employed the p86 fragment of poly(ADP-ribose) polymerase (PARP) as an early marker of apoptosis and demonstrated that elevation of testicular temperature was associated with testicular oxida-tive stress and germ cell apoptosis  . Fig. 8.4 Pathways to apoptosis caused by heat-induced oxidative stress in germ cells, mainly in primary spermatocytes. The upward arrow indicates increased expression and/or activity of the molecule. The downward arrow indicates decreased expression and/or activity of the molecule. Common apoptotic pathways (e.g., around caspases 2, 9, and 3 activation) are not shown in this figure testicles that are severely damaged due to heat stress; this may also be one of the reasons why there are controversies regarding the stage-specific heat susceptibility of germ cells. Intracellular signal transduction pathways activate caspase 3, which cleaves the caspase-activated deoxyribonuclease (ICAD) inhibitor and inactivates its CAD-inhibitory effect; this is a common effector of various stimuli to cause apoptosis  (Fig. 8.4). Activation of caspase 3, in which the p32 fragment is proteolysed to an 18-kDa fragment, is observed in testes of men with varicocele and is closely associated with scrotal temperature . Heat-induced apoptosis is believed to be mediated by the intrinsic mitochondrial pathway rather than the extrinsic death receptor pathway, namely, the Fas pathway [31-33]. Studies using the gld and Iprcg (lymphoproliferation complementing gld) mice, which harbor loss-of-function mutations in the Fas ligand and Fas, respectively, have revealed that heat-induced germ cell apoptosis is not blocked in these mice [ 31]. Therefore, the Fas-signaling system is not required for heat-induced germ cell apoptosis. On the other hand, the Fas system has also been involved in many aspects of germ cell apoptosis . A semiquantitative RT-PCR technique revealed that Fas-mediated germ cell apoptosis in rats was activated in response to a variety of proapoptotic stimuli, including heat stress . Involvement of the Fas pathway in heat-induced apoptosis of germ cells still remains controversial. These intrinsic and extrinsic pathways will occur at different phases after exposure to heat. In the intrinsic pathway, the release of cytochrome c from the mitochondria into the cytoplasm is a potent stimulus for caspase 9 activation. The opening of the mitochondrial permeability transition pore has been implicated as a key event in the disruption of mitochondrial membrane integrity, which is disturbed by oxidative stress, and cytochrome c is then released into the cytosol . Mitochondria produce basal levels of ROS in the form of single-electron leakage to oxygen during normal metabolism  . The Bcl-2 family is a widely recognized group of apoptotic regulators. This family consists of both pro- (Bax, Bad, Bak, Bid) and antiapoptotic (Bcl-2, Bcl-xL) proteins that modulate the execution phase of the cell death pathway, and their expressions are altered in testicular germ cell apoptosis. The proapoptotic Bid/Bax/ Bad moves from the cytosol to the outer mitochondrial membrane following an apoptosis-inducing signal, and the interaction between these Bcl-2 family proteins induces a conformational change, resulting in the release of cytochrome c from the mitochondria. Cytochrome c sequesters apoptotic protease-activating factor-1 (Apaf-1), and the complex activates initiator caspase 9, which in turn activates executioner caspases, leading to apoptosis [61-63] , The expressions of the initiator, caspase 9, and the effector, caspase 3, were detected within 2 h of heat treatment in heat-susceptible late pachytenes by immunofluorescence staining of active caspases 9 and 3 . All the proapoptotic proteins, Bax, Bid, Bak, and Bad, are upregulated along with caspase 9 mRNA and protein, indicating the involvement of the intrinsic pathway in the H,O2-induced testicular germ cell apoptosis . Other intrinsic factors such as the cellular redox status, cytosolic Ca2+ levels, ceramide, and amphipathic peptides can affect mitochondrial megachannel function  . In another study, increased levels of the serine-phosphorylated form of the inactive Bcl-2 in heat-susceptible germ cells after heat treatment compared with those in the controls and costaining for TUNEL and phospho-BCL-2 confirmed that Bcl-2 phosphorylation occurs only in those germ cells undergoing apoptosis , Blockage of caspase 2 activation prevents heat-induced germ cell apoptosis in rats by suppressing MAPK14  , Serine phosphorylation of Bcl-2 and activation of the MAPK14-mediated mitochondria-dependent pathway are critical for heat-induced male germ cell death in monkeys . Heat stress can also alter the expression of the Bax and Bcl-2 genes, where such changes are dependent on the sensitivity of heat stress . On the other hand, a redistribution of Bax from a cytoplasmic to paranuclear localization occurs only in those selective germ cells before their eventual apoptosis. The combined confocal and two-photon imaging of testicular sections costained for Bax and endoplasmic reticulum (ER) revealed colocalization of Bax with ER in the paranuclear areas of late pachytene spermatocytes 2 h after heat treatment, suggesting that Bax translocates to the ER early during apoptosis of heat-induced testicular germ cells . Despite this striking redistribution that was observed by immunocytochemical analysis, western blot analysis revealed that the Bax protein levels in total testis lysates remained unchanged  . Heat-induced Bax up-regulation and Bcl-2 down-regulation have been demonstrated in germ cells  ; however, it is unknown whether or not these phenomena are generated in response to the heat stress. The extrinsic pathway involves the activation of death receptors, namely Fas/ tumor necrosis factor receptor, leading to the activation of initiator caspase 8, followed by activation of executioner caspases 3, 6, and 7 and, subsequently, apoptosis . H2O2 was observed to mediate the up-regulation of Fas protein and its transcripts in spermatocytes and spermatids . Vydra et al. suggested that both mitochondria-dependent intrinsic and death receptor-dependent extrinsic pathways are involved in heat-shock factor 1 (HSF1)-induced apoptosis. This suggestion was based on their findings of increased levels of Bcl-2 family proteins, p53 protein accumulation, and elevated expression levels of caspase 8 and death receptor-interacting proteins (including Fas-associated death domain protein and TNF receptor-associated death domain protein)  . The tumor suppressor p53 determines the cell fate: apoptosis or cell cycle arrest. Its function differs in each testicular component and across different conditions of stress. In particular, its role in p53-dependent apoptosis in primary spermatocytes is well known [51, 69, 71-73] . In a study investigating a 3-day delay of apoptosis in p53-/- mice with experimental cryptorchidism, p53-dependent apoptosis was found to be responsible for the initial phase of germ cell loss in experimental cryptorchidism . The effects of heat stress on p53 expression and function in germ cells have not been fully investigated. Experimental vasectomy of rat induces oxidative stress in the testis  and the colocalization of p53-, Bax-, and TUNEL-positive cells in primary spermatocytes after experimental vasectomy of rat  . Furthermore, another study has reported the association between testicular oxidative stress, as measured by the expression of 4-HNE-modified proteins, and p53 expression  . Taken together, these results suggest that oxidative stress regulates the expression and function of p53 in germ cells. Fas is involved in heat-induced testicular germ cell apoptosis, and Fas-dependent apoptosis has been shown to be responsible for the p53-independent phase of germ cell loss in cryptorchid testes . p53 is expressed in male germ cells , and cell death is delayed in germ cells lacking p53 in experimental cryptorchidism . suggesting that the p53 pathway is involved in heat stress-induced germ cell apoptosis, especially in primary spermatocytes. In addition, expression of Mta1, which was originally identified in rat metastatic breast tumors, is decreased after heat stress, following by p53 expression and apoptosis of pachytene spermatocytes , Ohta et al. examined the differentiation of transplanted eGFP-labeled p53+/+, p53+/-, and p53-/- spermatogonia in cryptorchid conditions . Transplanted p53+/+ germ cells did not differentiate in the seminiferous tubules of cryptorchid testes, whereas donor germ cell differentiation was observed when p53+/- or p53-/- germ cells were transplanted into the seminiferous tubules of cryptorchid testes. Semiquantitative analyses of these histological observations indicated that the degree of differentiation was higher following the transplantation of homozygous p53-/- donor cells than of heterozygous p53+/- cells, suggesting that the p53 expression level is important for heat stress-induced germ cell apoptosis. These results indicate that heat stress-induced germ cell loss is the result of p53-dependent apoptosis . It is likely that under heat stress, p53 serves to control germ cell apoptosis in cells that differentiate from type A spermatogonia to spermatocytes, but not in haploid cells or in cells undergoing mei-otic division from spermatocytes, suggesting that the apoptotic mechanisms of sper-matocytes and haploid spermatids differ considerably. Upon heat stress, antiapoptotic signal transductions and apoptotic machinery are concomitantly activated. Uncoupling proteins (UCP) are mitochondrial inner membrane proteins that mediate proton leak and reduce ATP production  . UCP2 is capable of protecting germ cells from apoptosis, and its presence in elongated sper-matids might explain why these cells are more resistant to spontaneous apoptosis under normal conditions. In another study, when testes were exposed to heat for a short time (43°C for 5 min), UCP2 was detected in almost all cell types, and its total abundance increased by approximately sixfold . 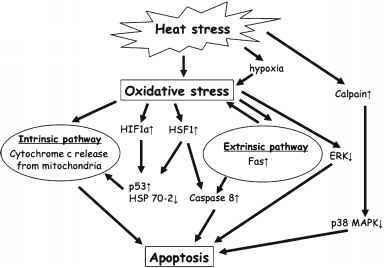 Heat stress also simultaneously activates signal transduction pathways leading to antiapoptosis activity and/or cellular proliferation. Key signaling factors such as Akt, p38, extracellular signalregulated kinase (ERK), and the heat-shock protein (HSP) HNRNPH1 protein  play important roles in antiapoptosis and cellular proliferation pathways.